At one week of age, the chicks have already grown considerably relative to the size of the eggs they emerged from. They are covered with fine white down, and in some places the pink skin still shows through. The nestlings are now one week old and have grown considerably. 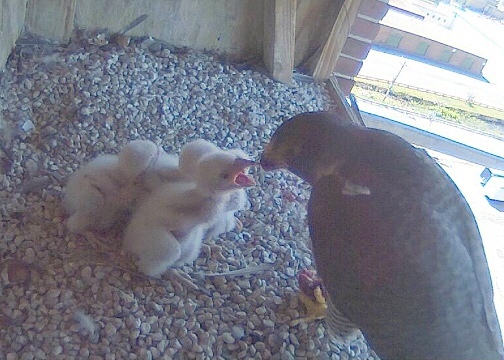 You’ll notice the nestbox are beginning to get “decorated” with whitewash–falcon poo, that is. When they have “to go,” the chicks project their feces up and out away from the gravel lined nest to help keep the immediate nest area clean. During this process anything in the way gets coated. It’s not so bad right now that they are still small, but as they grow they will inevitably make a mess in the nest box. Many have asked how many feeding trips are made each day. We’ve never actually counted but would guess at least 6-8. I usually notice 2-3 during the first half of the day. Double that for the second half of the day and then figure in a couple more and there’s the basis for my estimate. I’m sure some of the diehard watchers out there could say for certain! The actual number of trips will vary depending on the size of the prey items the adults bring in. Since the male is smaller, he likely concentrates on hunting smaller songbird-size prey while the larger female can take birds with more bulk to them. Oftentimes, the male will cache food as well, so if he isn’t successful hunting he can always fall back on his reserve supply. As the nestlings grow, so will their requirements for food! The adults will be very busy for the next several weeks with four chicks to feed.